The Colorado Violent Death Reporting System (CoVDRS) at the Colorado Department of Public Health and Environment, has just released a report on homicide death in Colorado. 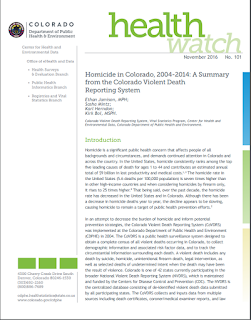 The report; Health Watch No.101: Homicide in Colorado, 2004-2014: A Summary from the Colorado Violent Death Reporting System, contains detailed information on the burden, characteristics, and overall profile of homicide deaths amongst Colorado residents. The goal of this report is to inform injury and violence prevention efforts, as well as raise awareness about the impact of homicide deaths in Colorado.